You can use this built-in tool to make adjustments and add effects to the source images or the whole movie. To adjust Image 1 or Image 2, click the Adjust button on the edit panel or choose the Image/Adjust menu. To adjust the whole movie, click the Filter button on the movie effects panel or choose the Movie/Filter menu. There are total 22 filters in FantaMorph version 4.0 where 9 filters for color adjustment (brightness, contrast, red, green, blue, hue, saturation, negative, gray) and 13 for image effect (smooth, bur, Gaussian blur, zoom blur, radial blur, sharpen, emboss, mosaic, oil paint, splash, cylinder, whirl, pinch). The best way to understand these effects is to try them out. Choose effects alone or in various combinations to discover what is best for your purpose. 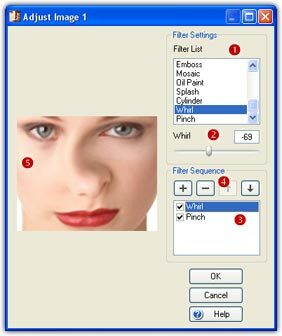 Choose a Filter from the Filter List ( ). Then you can adjust the filter parameter ( ) by dragging the slider or entering values into the text box. You can add up to 10 filters to the Filter Sequence ( ). There is a button group used to edit image sequence ( ). You can add (+) the current filter to the sequence, you can select one and then delete it (-), move it up (up arrow), or move it down (down arrow) by clicking the appropriate edit button. Please note that the order you add filters is important because different order will result in different effect. In the filter sequence, you can turn on/off a filter temporarily to compare the effect before and after use that particular filter. Any changes will be represented on the preview window ( ) in real time. You can only use 16 filters in FantaMorph SE. Movie Filter is only available in FantaMorph Deluxe. If the preview speed becomes slow after you add filters to the movie, you can turn off the "Preview Movie Filter Effects" option temporarily in the Edit Options window.